The fact that the monastic life is the evangelic life and that a monk is one who lives evangelically can also be seen in St. Gregory Palamas's homily on St. Demetrios of Thessaloniki, in which St. Demetrios is presented as a monk. Naturally in the time of St. Demetrios there was no monasticism as we know it today, but every Christian who kept the will of God was essentially a monk. In his homily on St. Demetrios, the divine Gregory presents the chastity of his body and soul. He lived in general chastity even though he was the highest officer in the Roman army. According to St. Gregory Palamas, St. Demetrios was graced with splendid prophetic power and was counted worthy of "the apostolic and teaching service and a high position". He was full of virtues and was not inferior to the saints in asceticism "and in their radiance of life". Yet he followed some, and was like others; superior to some, and surpassing others. He possessed many gifts. The warfare which St. Demetrios waged within his heart was comparable to the warfare of the great ascetics. He kept his nous pure of any unseemly thoughts, protecting the immaculate Grace of Holy Baptism, and had a will that harmonized with God's law "like a book of God and a tablet and plaque engraved by God or a writing tablet written by the finger of God and placed before all for the common use". In this way St. Demetrios was chaste in both body and soul. He had his citizenship in heaven and walked on an equal footing with the angels, having a body as well. So St. Demetrios seems to have had an angelic life and citizenship. 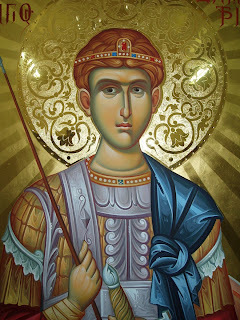 The patron saint of Thessaloniki was "both a teacher and an apostle, wise and chaste and holy, and we may say very beautiful and spotless, and made radiant by nature, zeal and grace". Comparing St. Demetrios with Job of the Old Testament, St. Gregory says that while Job was blameless, righteous and pious, just as Demetrios was, Job was not praised by God for chastity, something which St. Demetrios had. His chastity showed St. Demetrios to be higher than nature and on a par with the angels. Excerpt from the book St. Gregory Palamas as a Hagiorite.